If you missed out on all the Cyber Monday and Black Friday online deals and still have a lot of holiday shopping to do, Green Monday is coming! What’s Green Monday? It is the biggest online shopping day in December and is often called “Cyber Monday 2” because it’s the second biggest day for online holiday shopping. It always falls on the second Monday of December when there are just 10 shipping days left before Christmas. 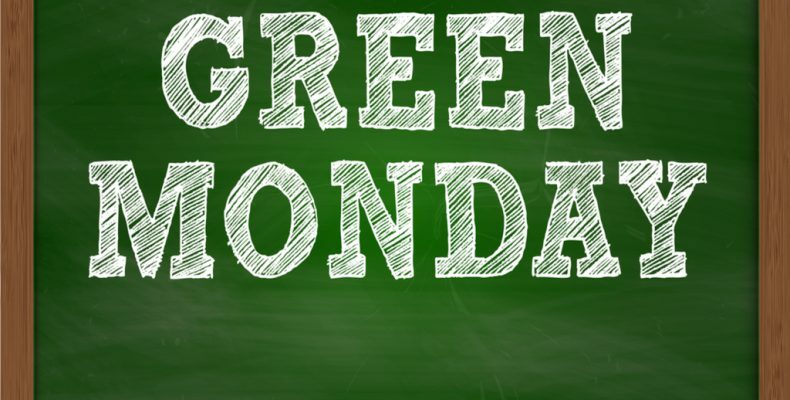 This year Green Monday will be December 10th! And the best part about this is that retailers usually offer great online deals so you don’t even have to leave your home! In 2017, Target offered $20 off your $100 online purchase, which made for some great deals. Also, December 14th, 2018, is Free Shipping Day when thousands of online stores offer free shipping with the promise that they’ll deliver it before Christmas. This is a great way to complete some of your last minute holiday shopping without having to head in store and brave the crowds. Free Shipping Day gets bigger every year! Over the last few years, this day has brought in more sales for retailers than Black Friday, so hopefully, we’ll be able to get lots of free shipping deals on this day.